The year was 1977. It belonged to the decade highlighted by disco dancing, NikNik shirts and BangBang pants. Happy Feet by Dr. Scholl and clogs on feet, Levi's 501, and Hang-Ten shirts were the hips' favored rags. Long hair and "joint" go together. Guy and Pip have separated with Guy ending up marrying Boyet de Leon. Ate Vi said goodbye to her "sweet sixteen" image by starring as Burlesk Queen. Cindy's, Big 20 and Shakeys were the places to be. Star Wars debuted. I was in my sophomore year in BS Architecture. Martial law was five years old. The declaration of martial law brought on a whole new set of rules for the old and young people alike; for all sectors - secular and sacred. Curfew at 12 midnight paved the way to "stay-in" at disco clubs and private parties. Radio and TV shows were monitored and were off air by midnight too. It was the 70's and the military "ruled" in the so-called New Society. The notion of a portable computer was still in the offing. There were no cable or internet or portable gaming consoles. VHS and Betamax were available but have not really caught on. Life was...Well, interesting and low tech. Listening to the radio was "in". My school work - plans and drawings - caused me many late nights or early mornings as the case may be. There were times that I had to go off sleep just to finish a plate or a project. The radio can only keep me company until midnight. After radio sign- off I was alone, trying to keep awake to finish my plate. The silence of those nights was deafening. The only tangible sound was the one made by my t-square and triangle as they come in contact. It was hard keeping awake. I wish I had a cassette player. One day I came home to find a spanking new SONY radio cassette player sitting on my drafting table. I was speechless! A radio cassette player! My first Sony product! "Mama!" I shouted, "Did you give me this Sony?" My mother came in my bedroom and said yes. She said she was able to get the radio cassette player from "Bumbay" on installment. I was so grateful to my mama. I bought all my "favorites" in cassette tapes. From then on keeping awake to do my school work was not a problem anymore. I had The Carpenters, Queen, Stylistics, Diana Ross, Michael Jackson and Earth Wind and Fire to keep me company. Who could fall asleep while September of EWF plays in the background? I was one of the chosen few who has her own personal Sony cassette player! In a time of oppression and depression, owning a personal radio cassette player was like winning the Sweepstakes. I brought the player to church choir practices too so we could record and playback our singing. It was like magic! But that's not the end of it. When I had my first child in 1980, as a new and young mother, I lack experience. My SONY radio cassette player helped me a lot. It was December and the wonderful Christmas songs by The Carpenters playing on my radio cassette player soothed my fretful baby daughter. Tomorrow is Christmas, so Merry and bright.. The moment my baby hears this song, she was pacified. My baby's first goo-goo and laugh were also recorded through my old-trusty-radio cassette player. As a matter of fact, my radio cassette player lived a full life. It played many a-lullaby to all my five children. Alas, it came to pass that a flash flood in 1991 soaked and muddied my Sony. Beyond repair, said the technician. It was like a death sentence to a beloved. 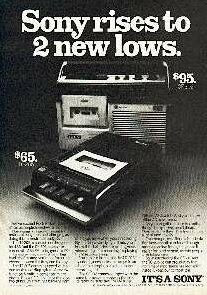 My first radio cassette tape player is gone. If not, I am sure I would still be using it today to play my old cassette tapes. My Sony radio cassette player.It definitely gave significance in my life just like the World’s First Noise Canceling Notebook Computer: VAIO T Series, which will really help me blog anywhere, anytime. i already sent the pics to your yahoo mail. thanks po for everything. i really had a great time with you & Kim! WOW! Very nice entry. Simple and sincere.